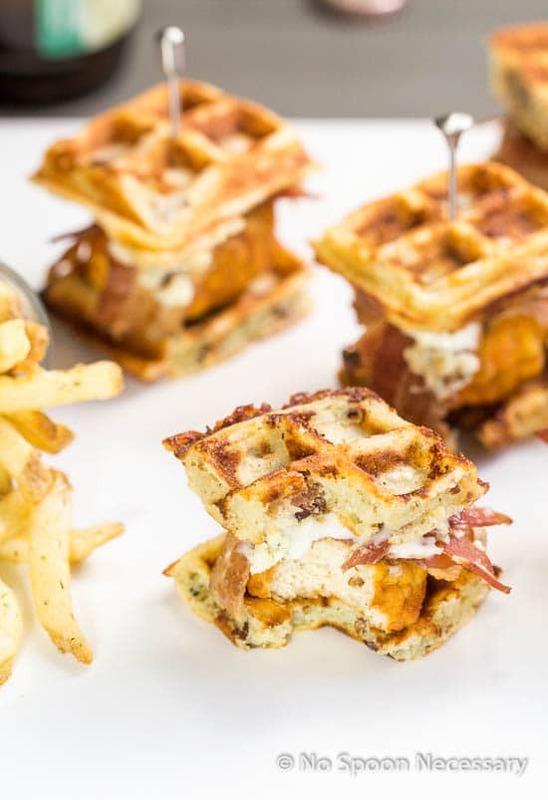 Crispy buffalo chicken, salty bacon, and creamy blue cheese sauce sandwiched between homemade blue cheese and bacon waffles to create the ULTIMATE waffle club sliders! Happy Bluesday Tuesday ya’ll. I am partnering with Castello for a summer of blue. But, before I get to that excitement, I want to clear something up. I believe there is a misconception running rampant on No Spoon. The misconception of Boy being my son. I completely understand the confusion, because he is a child. A man child. He is 36 going on 12 and he does love his chicken nuggies. However, he is my adorable, big kid at heart, husband. Not my son. 🙂 One day I will have to explain to you all how his nickname came to be, but not today. Let’s chat quickly about something that doesn’t need any clarification. 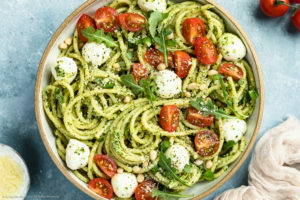 Heavenly food pairings. 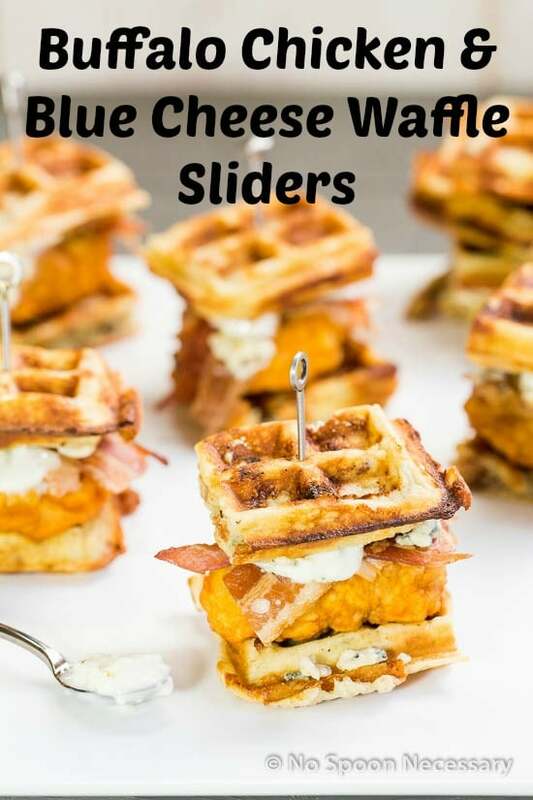 There are some ingredients that are universally accepted as a match made in heaven… such as peanut butter and jelly, macaroni and cheese, buffalo sauce and blue cheese, Sriracha and everything, blue cheese and bacon, and a big one down here in the south- chicken and waffles. 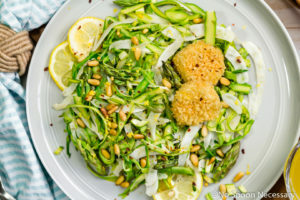 Therefore, when Honest Cooking and Castello contacted me about their #BluesdayTuesday campaign, I decided to let magically delicious food pairings be the inspiration for today’s post. I adore a good, potent, crumbly blue cheese… who doesn’t? So, as I was tearing open the packages of Castello crumbled blue, like a kid in a candy store, I already knew exactly what pairings I was going to jam pack together to create the ultimate slider. 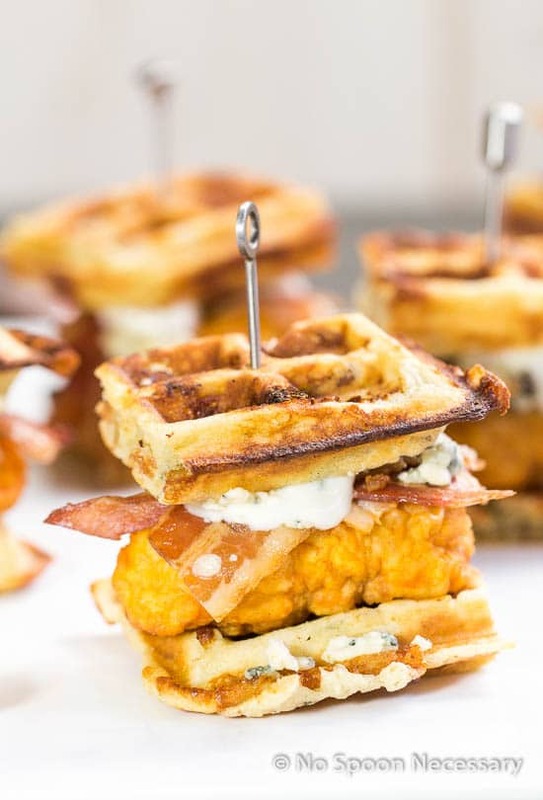 Chicken and waffles, buffalo and blue cheese, and blue cheese and bacon. 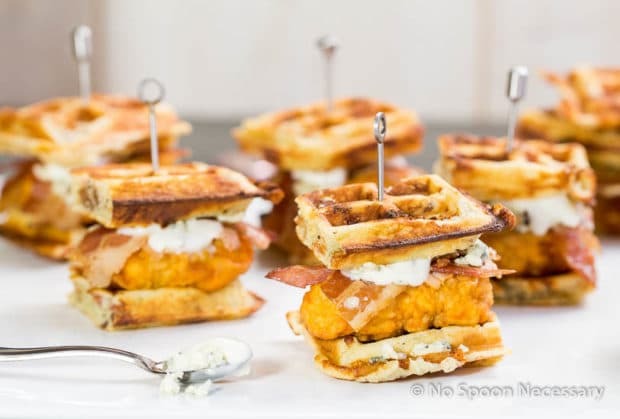 The culinary magic that unfolded is this – Buffalo Chicken & Blue Cheese-Bacon Waffle Club Sliders. Try and say that five times fast and backwards. 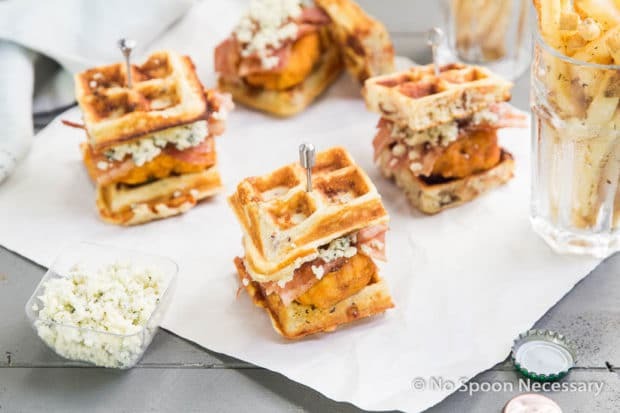 I topped the waffles with knock your socks off, amazingly delicious buffalo chicken nuggets, crispy bacon and tangy blue cheese crumbles. 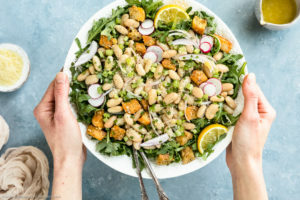 Then, I finished it all off with blue cheese dressing, which provides the perfect amount of coolness for your palate to finish off each and every bite. 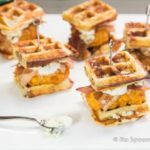 So bust out your waffle maker and join me in celebrating #BluesdayTuesday by preparing, and devouring, these scrumptiously savory buffalo chicken and blue cheese- bacon waffle club sliders. *This post was sponsored by Castello cheese. However, all opinions expressed within are of my own free will. To Cook Waffles: Spray preheated waffle maker with nonstick cooking spray. Add batter, about 3/4 cup per waffle, to maker. Cook according to manufacturer’s instructions, until fully cooked and cheese is a little oozing. (Mine took about 5-7 minutes). Transfer cooked waffles to wire rack and place in oven to keep warm. Continue cooking the remaining waffle batter. For Sliders: Adjust oven rack to the top third position. 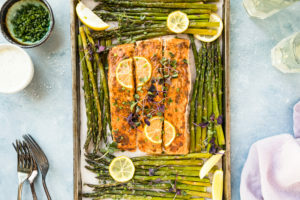 Preheat the oven to low broil. 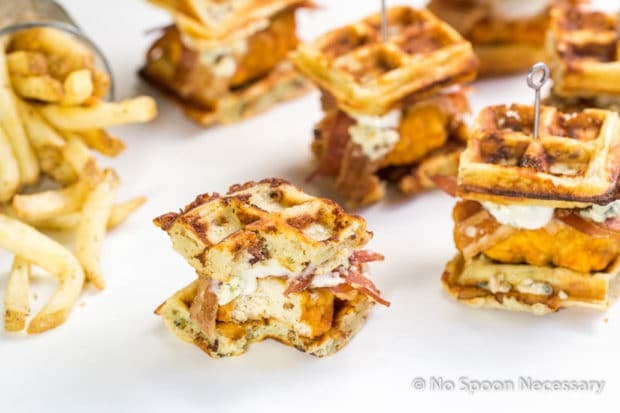 Using scissors or a chef knife, cut the waffles into four equal squares. 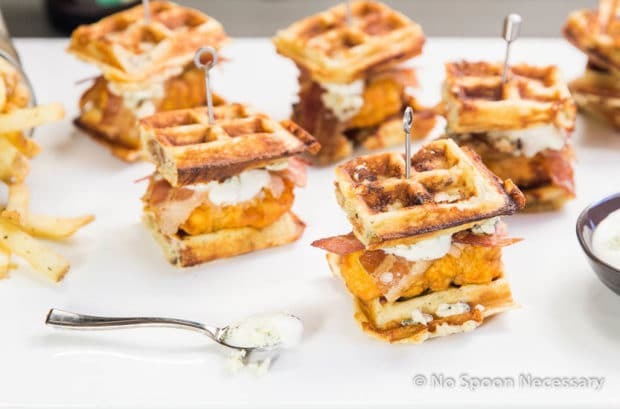 Place one buffalo sauce coated nugget on top of half of the waffle squares. 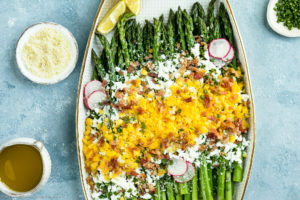 Top with two halves of bacon and crumbled blue cheese. 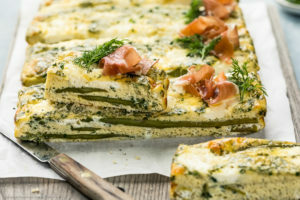 Broil until blue cheese is melted. 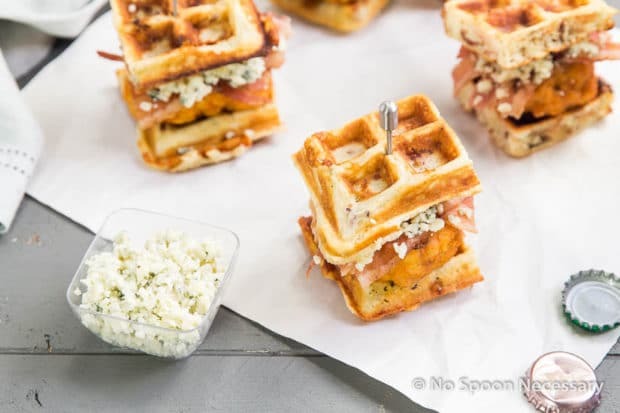 Transfer to a serving platter and drizzle with blue cheese dressing (optional) and top with remaining half of waffle squares. Serve warm and enjoy! This is the perfect blend of overindulgence that I need in my life. Once again, another winner. Thanks, Adam. This slider is most definately on the overindulgent side, but well worth the calories and effort 🙂 Cheers, buddy!